We’re finally getting a taste of real winter in North Carolina. A couple of weeks back, the local news even warned of an impending winter storm that was set to “blanket the Charlotte region with up to five inches of snow.” My first reaction was, “Yeah, right.” It never really snows where I live, and if it does, the snow stays on the ground for about fifteen minutes then it melts. Well, to my surprise we actually had a real live snow storm with snow that stuck to the ground for a couple of days. It’s been pretty cold ever since, with the exception of two or three days when the temperature reached sixty degrees. All this cold weather is perfect for whipping up pots of warm and comforting soup. Homemade soup never has to be boring. Exciting and flavorful soups can be prepared with common pantry staples. Chicken noodle soup is good, but sometimes I want to shake things up a bit and do something out of the ordinary. Since I’m a big fan of Mexcian cusine, the first soup I thought of was Posole Rojo. This is a stick-to-your-ribs soup that doesn’t disappoint, and it’s simple to prepare. 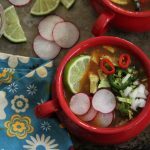 Traditional posole has a rich broth made with pork, red chiles, and lots of fresh add-ins like shredded cabbage, radishes, cilantro, lime, and avocado. This soup is hearty and festive, and it’s best served family style directly from the pot with garnishes served in dishes so everyone can help themselves. 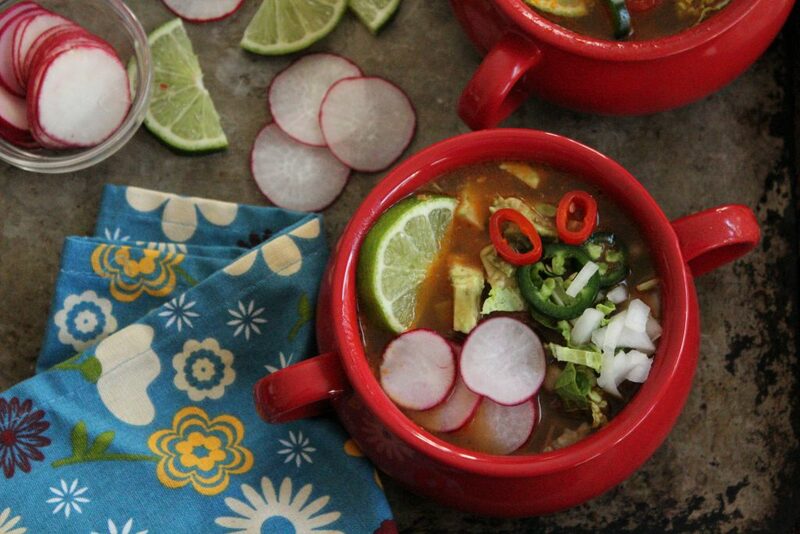 Posole Rojo is a slow-cooked soup that’s perfect for a snowed-in day of cooking. Break the stems off the chiles de arbol and ancho chiles and shake out the seeds. Place the chiles in a bowl and cover completely with boiling water. Soak until soft, about 30 minutes. Transfer the chiles and 1½ cups of the soaking liquid to a blender. Add the smashed garlic and 1/2 teaspoon salt and blend until smooth. Strain through a fine-mesh sieve into a bowl, pushing the sauce through with a rubber spatula. Discard the solids. Rub the pork with the cumin and ½ teaspoon salt. Heat 1 tablespoon vegetable oil in a Dutch oven or large pot over medium-high heat. Add the pork and brown on all sides, about 7 minutes. Transfer the pork with a separate plate. Stir in 2 cups water, chicken broth, oregano, bay leaf, 1/2 teaspoon salt and 1/2 cup to 3/4 cup of the chile sauce (depending on your preference). Add the pork and any collect juices to the pot. Bring to a simmer, then reduce the heat to maintain a low simmer. Partially cover and cook, turning the pork a few times, until tender, about 3 hours. Stir in the hominy and beans, and continue to simmer, uncovered, until the pork starts falling apart, about 1 more hour. Remove the bay leaf. Transfer the pork to a cutting board. Use two forks to shred the meat. Add additional water or broth if the posole seems too thick. Season with salt. Serve with assorted garnishes and the remaining chile sauce. 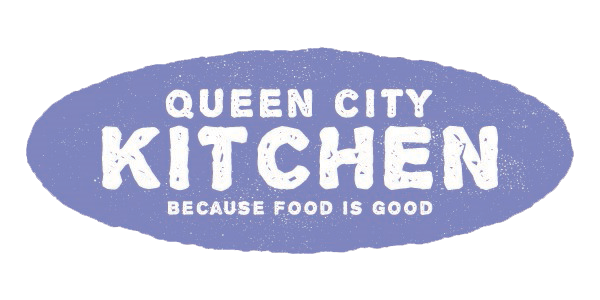 This entry was posted in Dinner, Pork, Recipes, Soup, Tex-Mex and tagged braised pork, comfort food, Mexican cuisine, soup on January 31, 2018 by Andria Gaskins.